You will fall in love with this fabulous home in coveted serene lake side area across from open desert and near new south side marina development. Lovely front courtyard to enjoy gorgeous mountain views. Beautifully remodeled kitchen that features granite,back splash, pullout drawers, kitchen island and bay window for your dinette. Then step into large living room with cozy fireplace,pot shelves two tone paint, and formal dining table for all your family gatherings. Master bath includes duel sinks, walk in shower, soaking tub, and walk in closet. Spacious rooms throughout. Hall bath also recently remodeled with granite and vanity. This home comes beautifully furnished and turnkey. Indoor laundry with cabinets and closet. Out back is an awesome screened in AZ room to spend time with loved ones,, a lovely waterfall, grill on your patio that is that is already plumbed for outdoor kitchen, plenty of room for pool and backs to wash for added privacy. 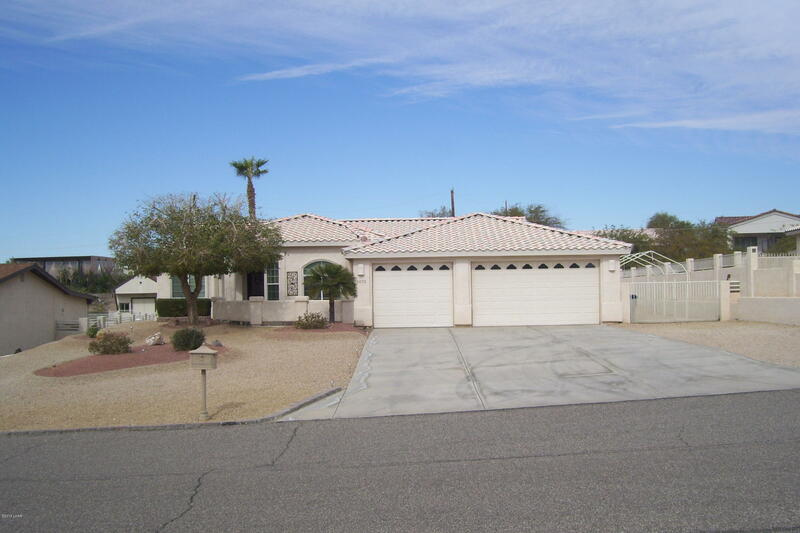 Three car garage with 8ft doors,stained concrete, cabinets and gated motor home parking with hook ups. Home warranty included! Do not miss this opportunity to make this amazing home in this special location your perfect Havasu home! Bedroom 3 Size: 13.4 x 11.